People who possess native fauna for the purpose of rehabilitation for more than 72 hours now require a Fauna Possessing (other purposes) Licence from the Department of Biodiversity, Conservation and Attractions (DBCA). This change came into effect on 1 January 2019 when the Biodiversity Conservation Act 2016 and Biodiversity Conservation Regulations 2018 replaced the Wildlife Conservation Act 1950 and the Sandalwood Act 1929 and their associated regulations. New licences will cost $250 following a transition period but any current Wildlife Conservation Act or Regulations licences continue to be valid until they expire. Provide adequate equipment for carers through organisations such as FAWNA. 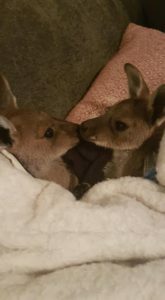 If you find a sick, injured or abandoned animal and you require advice you should contact the Wildcare Helpline on 9474 9055. Now that “Spirit fingers” (Spirit) is free of ticks (pictured left), she can join her foster sister “Jazz hands” (Jazz), currently in rehabilitation with Linda Moyle. Picture courtesy FAWNA.